This beautiful ornament was crafted using antique mold and is very sturdy. 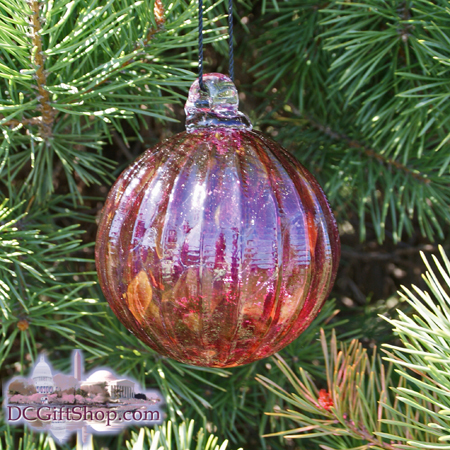 Cranberry Red and opaque, it is quite ornate for a soda-lime hand-blown glass item. Discover the near-extinct art of glass-blowing with any of the hand-crafted ornaments we offer. Vertically it is scalloped and horizontally there are very small ridges from the glass mold. This "optic" ornament was hand-blown into a very old Victorian-style antique mold acquired by a craftsmen from a long defunct glass-blowing operation in Ohio. Since each one is hand-made (although with a mold, not "free-blown") no two are exactly the same and this gorgeous glass is crafted with pride in the U.S.A. Ornament measures 3 inches across.